We provides you with minimally invasive treatments and ultramodern surgery techniques in the field of plastic and aesthetic surgery. Plastic surgery makes it possible to restore functions of your body after tumors, grave illnesses/diseases or as a result of congenital malformations. The aesthetic treatments and surgery procedures can fulfill your desire to reconcile your perception of your own body with your awareness of life. Dr. Sattler will be glad to comprehensively counsel you on plastic and aesthetic surgery and treatments. The highly specialized plastic surgery treats and cures hand disorders, deformities and tumors surgically. Entrapped nerves can lead to a feeling of numbness in hand and fingers, which may result in advanced manual restrictions and a higher risk of injuries. Special surgical techniques enable us to gently operate the nerve and restore proper manual function. We will be glad to give you advice and find a solution to your problem—together with you. Exposition to sun or genetic factors can lead to a facial tumor, which may impair eyes, nose or mouth or even render them useless. Removing the tumor and preserve facial structures and functions, is the goal of plastic surgery. Tumors, infections and injuries can damage the arms, legs and the trunk, making a plastic-surgical reconstruction of the soft tissue and skin envelope necessary. Tumors, infections and injuries can damage the surface of our body, making a reconstruction of soft tissue and skin envelope necessary. Plastic surgery aims at reconstructing the damaged soft tissue and skin envelope. The highly specialized aesthetic surgery at Beta Klinik makes it possible to treat and operate facial changes due to age minimally invasively. Saggy eyebrows, cheeks or corners of our mouth may lead to a tired and exhausted look. These signs of age can be corrected so that your looks are in harmony with your mind. Our neck moves continuously and often shows signs of age early. The area between the lower jaw and neck loses its definition and appears less dynamic. A double chin might form due to weight gain. A liposuction (reduction of fat) in the neck area can remove fat deposits, yielding a firm skin and a better definition. A neck lift can be combined with a facial lift, both correcting the signs of gravity and creating a fresh, natural look. The look of your face will be in harmony with your mind. Saggy eyelids or eye bags often cause us to look tired and exhausted. Our friends, family members and colleagues often respond to our looks and may address these “issues”. Glancing at our face in the mirror in the morning may also be not pleasant anymore. Such facial changes can be corrected thanks to aesthetic surgery even as an outpatient. We will be glad to give you advice and detailed information so that you can be at ease and feel comfortable in your own skin again. Our nose is a very important part of our face and also a distinctive trait. If it is too broad or crooked, the desire to correct it can emerge, which can be dealt with thanks to aesthetic surgery and the reshaping of bones, cartilage and skin. Deformities of the nose can be genetic or occur as a result of an accident. Minimally invasive surgery techniques enable us to operate through a nostril. Special circumstances may make a small incision at the nasal bridge necessary. The internal structures of the nose like nasal septum, nasal concha or polyps are treated together with our ear, nose and throat specialists. Otoplasties, that means ear corrections, can be necessary in case of prominent ears since birth, after accidents or changes due to age. Prominent or deformed ears may attract attention, and we may not feel at ease with them anymore as we feel observed. We will talk about an ear correction individually in detail with you, plan an individual solution and adjust it to your needs. In most cases, the incision to correct the ear is not or merely visible after surgery. Changes of the male and female breast can be surgically adjusted thanks to the highly specialized aesthetic surgery. Some people may think they breasts are too small, deformed, saggy or too big, which may hinder them to move about freely. Changes of the breast since birth or due to age can attract unwanted awareness in public or intimate situations. We may feel observed and uncomfortable. Every change of the breast will be examined with diagnostic imaging procedures in order to rule out a breast disease and to grant maximum safety. Surgical corrections include breast augmentation, lift and reduction. Those procedures are adjusted to your individual needs and combined, if necessary. Staying 1-3 days at Beta Klinik is recommended subject to the surgery performed. The highly specialized aesthetic surgery also treats changes of the tummy, which can be due to pregnancy (weight loss or gain), muscular damage, fat deposits or saggy skin. Those changes can hinder us to move freely about since we may judge them to be unattractive or even annoying. Changes of the tummy since birth or due to age can attract unwanted awareness in public or intimate situations so that we feel observed and uncomfortable. Every change of the tummy will be examined with diagnostic imaging procedures in order to rule out abdominal diseases and adhesions and to grant maximum safety. 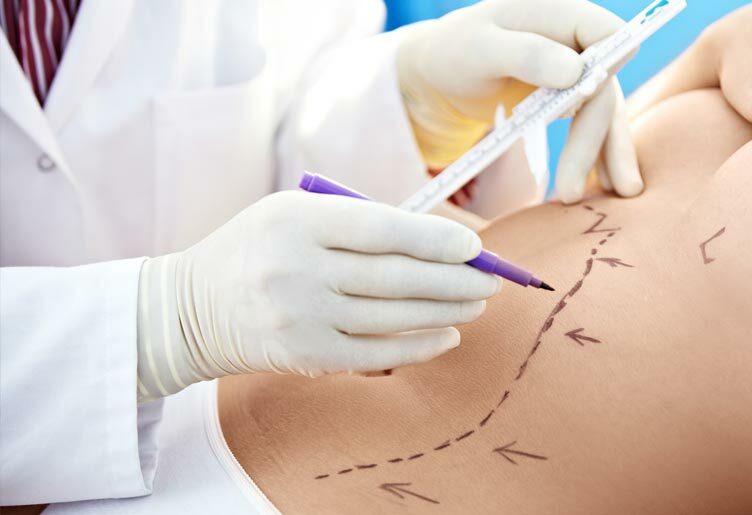 Surgical corrections include tummy lift, mini lift, navel correction and liposuction (fat removal). Staying up to 3 days at Beta Klinik is recommended, depending on the surgical procedure. After gaining or losing wait and changes due to age, excessive skin may be present at the thighs or upper arms. This can be restrictive during sports activities and wearing clothes. We may feel uncomfortable and constrained. Surgical corrections include thigh and upper arm lift, improvement of skin and liposuction (fat reduction). We will give you comprehensive advice on the very technique that will produce the best outcome for you so that you can feel at ease and comfortable in your skin again. Weight gain or loss or changes due to age can produce excessive skin at our buttocks. The amount of fat can increase and muscles decrease. This can be restrictive during sports activities and wearing clothes. We may feel uncomfortable and constrained. Surgical corrections include buttock lift, improvement of skin and liposuction (fat reduction). Own body fat injections can help correct the buttock in its shape or enlarge it. We will give you comprehensive advice on the very technique that will produce the best outcome for you so that you can feel at ease and comfortable in your skin again. An increase of fat tissue under our skin can be caused by weight gain or as a result of aging. This can be restrictive during sports activities and wearing clothes. We may feel uncomfortable and constrained. Sometimes, even engaging in sports activities and changing our diet may not result in the loss of fat. Surgical corrections include improvement of skin, liposuction (fat reduction). The extracted fat can also be injected into other areas of our body to add volume. Own body fat injections can help correct or reconstruct various areas of our body. We will give you comprehensive advice on the very technique that will produce the best outcome for you so that you can feel at ease and comfortable in your skin again. Facial changes due to age can be treated minimally invasively thanks to specialized aesthetic treatments. We may look tired and exhausted because of saggy eyebrows, cheeks or corners of our mouth. These signs of age can be corrected in order to harmonize your body and your mind. Botulinum toxin treatments reduce or even remove wrinkles completely for about 6 months. The treatment can then be adjusted to your individual facial changes. Facial changes due to age are treated highly specifically and minimally invasively within the field of aesthetic surgery. Tear throughs, sunken cheeks or saggy corners of our mouth make us look tired and exhausted. But in order to harmonize your body and your mind, these signs of age can be corrected. Our own production of hyaluronic acid decreases with age, but hyaluronic acid can be injected so that wrinkles are reduced or removed and volume is added. The results of an injection of hyaluronic acid last about 12 months. They are not permanent but trigger repair processes on a cellular level. The treatment can then be precisely adjusted to your facial changes. The own body fat injection is a brilliant procedure, which includes the removal of undesirable fat deposits and the processing as well as injection of this very fat into areas where it is missing. This way, we can treat changes of the face, breasts or buttocks highly specialized and minimally invasively. Tear throughs, sunken cheeks or sagging corners of our mouth often cause us to look tired and exhausted. However, these signs of age can be corrected to harmonize your body and your mind. The breasts or buttocks can be reshaped and enlarged, or indentations can be corrected. Missing volume of the skin can be restored. This is a permanent treatment. But, due to sports activities and the burning of fat, the amount of fat can be reduced. In this case, we can adjust the treatment to your individual changes and repeat it. Despite sports activities and an appropriate diet, a side effect of aging is fat deposits of the neck that cannot be burned by ourselves. Another factor is weight gain. Both cases make the area between the lower jaw and the neck look less dynamic. A double chin can also be a result of weight gain. A liposuction (fat reduction) of the neck area makes it possible to remove fat deposits, to lift the skin and to improve the definition of the neck. It is also possible to include a facial lift in order to correct gravity´s impacts and to harmonize your body and your mind. Changes of the skin due to age or sun can be corrected gently and minimally invasively thanks to aesthetic laser medicine. It is not always recommended to remove those changes with a scalpel and leave scars. In order to ensure that the change is benign, we will take a tissue sample using local anesthetics and send it in for further examination to a histological laboratory. After laser treatment, the removed skin heals dot-like like a graze. The necessary scar care will be explained in detail so that you can do it yourself.